Since I am incapable of cleaning my house without including some sort of decorating project, the week before Thanksgiving I was a cyclone of activity - hanging new curtains, switching out hardware on a table, picking up a @(*&^ stomach bug that blossomed Thanksgiving evening... and finishing two drawings. 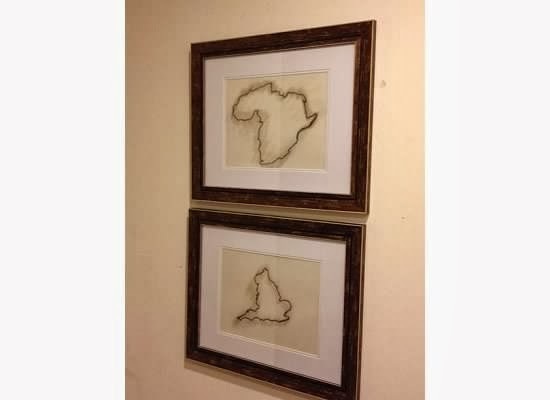 When we first moved into our house, I printed and framed maps of England (where my husband is from) and Africa (my ancestral home). It's a little lopsided, placing the one country against an entire continent, but 1) I don't know the African country I descend from (yet) and 2) I liked that the maps sort of silently told that story while giving homage to both our heritages. It's also a little lopsided because technically, my husband's ancestral origins are at least partially in France. So my maps left out a few details. And so do my drawings. 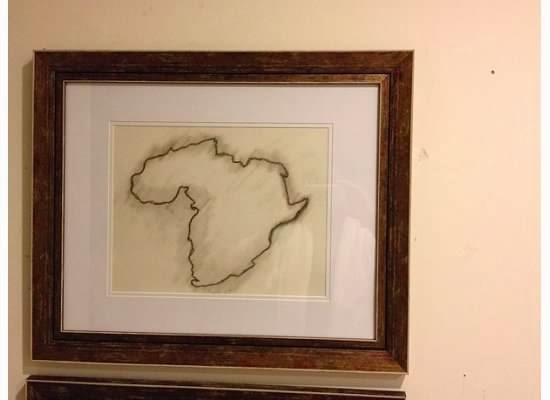 Over time, the maps gave way to other pieces of art, but I still had a big wall upstairs that needed tending, so I drew these outlines of Africa and England. I wanted something simple since another big wall was very close by and is pretty busy. See them peeking out up there? 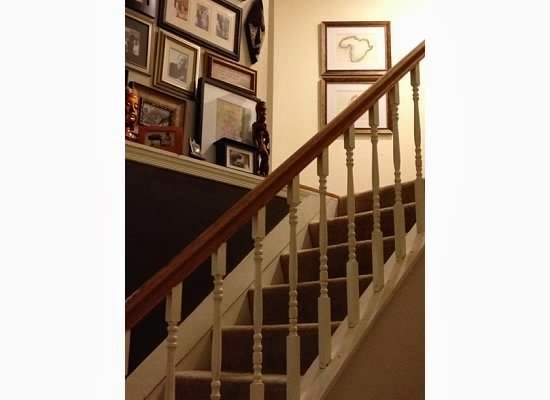 See them making it really obvious that I need to paint the banister? But I digress. Here's a closer view. I made them with oil based pastel pencils, which are essentially very fancy crayons. They provide a consistency somewhat like what you'd get if you mixed a graphite pencil, a crayon, and oil paint. I drew the outline for my land masses and then smudged the line slightly to give it a little ooomph. They aren't fancy, but I'm pleased with the turnout of this simple art project. They are also not perfect. I could have smudged more evenly. 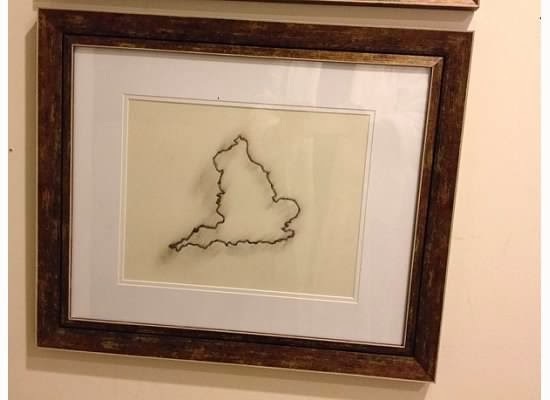 I also could have drawn them to scale, but that would have required either a huge outline of Africa or a teensy outline of England, so I cheated a little. Also, my oldest son pointed out that I'm missing some outlaying islands on both. So these are the mainlands I guess. Sketch paper and frames from Michael's. LOVE this! My best friend's dad is from Kenya, and my friend's husband was born in the Philipines. This would be such a neat project for them, too! And I love your gallery wall!